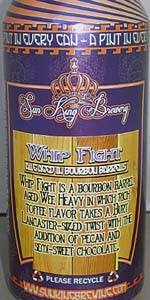 Whip Fight is a bourbon barrel aged Wee Heavy in which rich toffee flavor takes a Burt Lancaster-sized twist with the addition of pecan and semi-sweet chocolate. Taste: Vanilla, chocolate, pecans, chewy toffee, bready sweetness, etc. Overall: Quite the tasty beverage. The additions of pecans and chocolate do kind of blur the lines of the base beer with the barrel, but I enjoyed it in the end. THIS IS THE NEW JANUARY 26, 2017 RELEASE. After a 2 year layoff, it returns. This is a great dessert beer. Bourbon barrel + scottish style bring big sweet to the front of every sip; chocolate adds depth. Pecans were more subtle, but still detectable. Please let it warm. Sweet like Wee Muckle, but more intense toffee and caramel flavors from the bourbon barrels. I don't taste much of the pecan or semi-sweet chocolate used, but it is very, very rich; I'd call it a dessert beer for sure. No head in the dark beer, ruby sides. On draft at the tap takeover in Carmel at the pint room. Smells of dark fruit and sweet chocolate. Tastes for sure of semi sweet chocolate. Little notes of the barrel character. Overall, my wife makes brownie bombs that use semi sweet chocolate. It hits that taste exactly on the head. I've never had a beer that so perfectly hits a promised additive as this one. Pick up your limit of this next time it's canned, NYD! Edit: the 2017 version, is not the same as the above description. Almost no to little chocolate presence, and the pecan is way more pronounced. I did not like the new version near as much. The ratings shall reflect. Lots of people are still diggin the change though. Way too tart for me, ultimately disappointing. Got this in a trade from a buddy that works across the street from the brewery. The first time I tried this was a 2013 batch which blew me away, but the second batch (2014) was not what I had tasted before. Appearance- Super dark reddish brown with a thin khaki head. Almost black. Smell(2013)- Lots of toffee, caramel, very dark fruit. Main smell is chocolate, -Lots of it- Like a Snickers bar in a glass! Perfect dessert beer! 2014 was the same , but without the chocolaty goodness. Had a tart type scent to it. Taste- 2013- Followed the nose to a tee! Ultimate dessert brew, tons of milk chocolate right at the front with toffee and vanilla at the middle of the mouth. finished very smooth with the dark fruit on the back end. 2014- Tartness right at the front covering all the sweet goodness, Ouch! not what I was expecting. down the drain we go. Sorry, Iam not a fan of sour beers. Overall- 2013 was solid, 2014....eh, no. Look: pretty typical scotch ale look. Smell: really prominent bourbon barrel initially, then more of the classic scotch ale flavors (caramel/toffee, brown sugar). Also a hint of fruit jam. Taste: dominated by a tart, blackberry/raspberry flavor. Lots of the standard wee heavy flavors, but just overwhelmed by that tartness, and a good chunk of boozy heat. Not entirely I enjoyable, but unexpected, and seemingly out of character. Feel: dry, with a medium-light body and understated carbonation (stylistically appropriate). Overall: if they billed this as a raspberry wee heavy or something, I'd say it hit the mark perfectly. As it is, it just tastes too wild for the style. Probably my least favorite BA wee heavy, unfortunately. What the hell is a "whip fight"? Is this an Indiana Jones reference? This should be called "German Chocolate Cake" because that's exactly what it tastes and smells like. Maybe a little much on the sweet side and it could use more body and barrel character, but it's still a very tasty dessert beer.